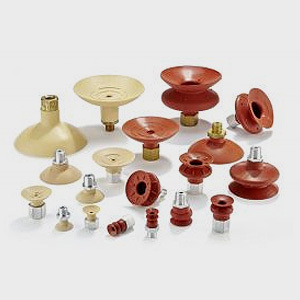 Uses of Vacuum Suction Cups and How Enkosi Can Supply These for You | Enkosi Pty. Ltd. Vacuum suction cups are man’s solution to the machine-to-product interface. They hold fragile or durable objects with equal dexterity, endow parts-handling machines with grip, and use that ability without ever damaging the surface of that held object. There are literally thousands of variants on this suctioning theme. Fortunately, Enkosi leads the field in this air-powered gripper category. If a scratch-prone panel of glass or painted metal part is moving along the production line, a robotic arm requires rubber cups to hold the part. The assembled panels of a car, for example, are glossy but never scratched on the assembly line because vacuum suction cups are in use. Likewise, the packaging and printing industry both use suction force. The cups are obviously already equipped with a soft rubber, but this passive polymer isn’t enough to deliver true grip. It takes a combination, a synthetic rubber cup and its air-sucking inner cavity to really generate the grip that holds glass, plastic, painted metal, and even sheets of paper in place during a complex production run. Primarily, we’re referring to the vacuum suction cups, the non-damaging grippers that work in automotive facilities, mailrooms, die cutting machines, print machine collating stations, and more. Unashamedly, we’re also referring to the services offered by Enkosi, a manufacturer and supplier that has access to the very best in vacuum gripping technology. We know full well that every robotic arm requires a customised gripping implement. It’s the same with all of the other fields we’ve listed; every one of these automated lines requires a uniquely profiled suction cup. The tooled rubber part has to be shaped properly, made from an intelligently selected polymer, and designed to work at a rated vacuum setting so that an assumed load can be properly supported. The Enkosi supply maxim checks off all of these supply variables, so plastic deterioration, perhaps caused by a corrosive oil, won’t abrade the cup material. Tailored profiles and application-specific synthetic rubbers are only the beginning. The parameters quoted by the client then go on to determine flanged outlines and counterbores, deep cup profiles and narrow shapes, all the details that make the difference between a clumsy automated grip and a reliable grasp that works repeatedly across every machine stage. Select a cost-effective and comprehensive vacuum suction cup partner by discussing your application, then see our solution in action aon your equipment line’s dependable process handling appendage.